Premium 2 channel oscilloscope with 70-300 MHz Bandwidth, 2.5 GSa/s sample rate, 10 Bit A/D converter, 20 Mpts memory depth and a 25.7 cm touchdisplay with a resolution of 1280x800 pixel. Upgradable to a MSO with a 16 channel logic analyzer, 1 channel waveform generator and pattern generator. 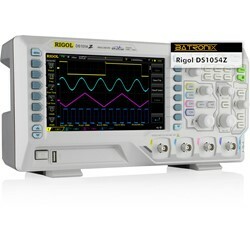 Save 50% on the RTB-PK1 option bundle with the purchase of a new RTB2000 oscilloscope! Valid until 30.06.2019! 2x RT-ZP03 probe and power cord. 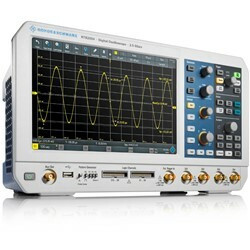 Premium 4 channel oscilloscope with 70-300 MHz Bandwidth, 2.5 GSa/s sample rate, 10 Bit A/D converter, 20 Mpts memory depth and a 25.7 cm touchdisplay (1280x800 pixel). Upgradable to a MSO with a 16 channel logic analyzer, 1 channel waveform generator and pattern generator. 4x RT-ZP03 probe and power cord. Premium 2 channel oscilloscope with 70 MHz Bandwidth, 2.5 GSa/s sample rate, 10 Bit A/D converter, 20 Mpts memory depth and a 25.7 cm touchdisplay (1280x800 pixel). Incl. MSO option with 16 channel logic analyzer. Upgradable with a 1 channel waveform generator and pattern generator. RTB2002 oscilloscope, RTB-B1 MSO upgrade option, 2x RT-ZP03 probe, logic analyser cable with 16 logic probes and power cord. Premium 4 channel oscilloscope with 70 MHz Bandwidth, 2.5 GSa/s sample rate, 10 Bit A/D converter, 20 Mpts memory depth and a 25.7 cm touchdisplay (1280x800 pixel). Incl. MSO option with 16 channel logic analyzer. Upgradable with a 1 channel waveform generator and pattern generator. RTB2004 oscilloscope, RTB-B1 MSO upgrade option, 4x RT-ZP03 probes, logic analyser cable with 16 logic probes and power cord. Premium 2 channel oscilloscope with 100 MHz Bandwidth, 2.5 GSa/s sample rate, 10 Bit A/D converter, 20 Mpts memory depth and a 25.7 cm touchdisplay (1280x800 pixel). Incl. MSO option with 16 channel logic analyzer. Upgradable with a 1 channel waveform generator and pattern generator. RTB2002 oscilloscope, RTB-B1 MSO upgrade option, RTB-B221 bandwidth upgrade (100 MHz), 2x RT-ZP03 probe, logic analyser cable with 16 logic probes and power cord. Premium 2 channel oscilloscope with 200 MHz Bandwidth, 2.5 GSa/s sample rate, 10 Bit A/D converter, 20 Mpts memory depth and a 25.7 cm touchdisplay (1280x800 pixel). Incl. MSO option with 16 channel logic analyzer. Upgradable with a 1 channel waveform generator and pattern generator. RTB2002 oscilloscope, RTB-B1 MSO upgrade option, RTB-B222 bandwidth upgrade (200 MHz), 2x RT-ZP03 probe, logic analyser cable with 16 logic probes and power cord. Premium 2 channel oscilloscope with 300 MHz Bandwidth, 2.5 GSa/s sample rate, 10 Bit A/D converter, 20 Mpts memory depth and a 25.7 cm touchdisplay (1280x800 pixel). Incl. MSO option with 16 channel logic analyzer. Upgradable with a 1 channel waveform generator and pattern generator. RTB2002 oscilloscope, RTB-B1 MSO upgrade option, RTB-B223 bandwidth upgrade (300 MHz), 2x RT-ZP03 probe, logic analyser cable with 16 logic probes and power cord. Premium 2 channel oscilloscope with 100 MHz Bandwidth, 2.5 GSa/s sample rate, 10 Bit A/D converter, 20 Mpts memory depth and a 25.7 cm touchdisplay (1280x800 pixel). Upgradable to a MSO with a 16 channel logic analyzer, 1 channel waveform generator and pattern generator. RTB2002 oscilloscope, RTB-B221 bandwidth upgrade (100 MHz), 2x RT-ZP03 probe and power cord. Premium 2 channel oscilloscope with 200 MHz Bandwidth, 2.5 GSa/s sample rate, 10 Bit A/D converter, 20 Mpts memory depth and a 25.7 cm touchdisplay (1280x800 pixel). Upgradable to a MSO with a 16 channel logic analyzer, 1 channel waveform generator and pattern generator. RTB2002 oscilloscope, RTB-B222 bandwidth upgrade (200 MHz), 2x RT-ZP03 probe and power cord. Premium 2 channel oscilloscope with 300 MHz Bandwidth, 2.5 GSa/s sample rate, 10 Bit A/D converter, 20 Mpts memory depth and a 25.7 cm touchdisplay (1280x800 pixel). Upgradable to a MSO with a 16 channel logic analyzer, 1 channel waveform generator and pattern generator. RTB2002 oscilloscope, RTB-B223 bandwidth upgrade (300 MHz), 2x RT-ZP03 probe and power cord. Premium 4 channel oscilloscope with 300 MHz Bandwidth, 2.5 GSa/s sample rate, 10 Bit A/D converter, 20 Mpts memory depth and a 25.7 cm touchdisplay (1280x800 pixel). Incl. MSO option with 16 channel logic analyzer. Upgradable with a 1 channel waveform generator and pattern generator. RTB2004 oscilloscope, RTB-B1 MSO upgrade option, RTB-B243 bandwidth upgrade (300 MHz), 4x RT-ZP03 probes, logic analyser cable with 16 logic probes and power cord. 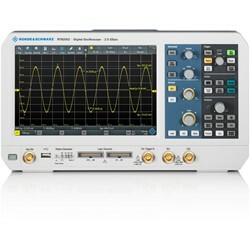 Premium 4 channel oscilloscope with 300 MHz Bandwidth, 2.5 GSa/s sample rate, 10 Bit A/D converter, 20 Mpts memory depth and a 25.7 cm touchdisplay (1280x800 pixel). Upgradable to a MSO with a 16 channel logic analyzer, 1 channel waveform generator and pattern generator. 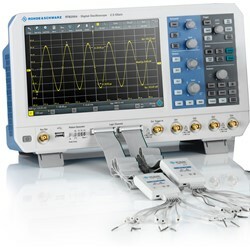 RTB2004 oscilloscope, RTB-B243 bandwidth upgrade (300 MHz), 4x RT-ZP03 probes and power cord. Premium 4 channel oscilloscope with 200 MHz Bandwidth, 2.5 GSa/s sample rate, 10 Bit A/D converter, 20 Mpts memory depth and a 25.7 cm touchdisplay (1280x800 pixel). Incl. MSO option with 16 channel logic analyzer. Upgradable with a 1 channel waveform generator and pattern generator. RTB2004 oscilloscope, RTB-B1 MSO upgrade option, RTB-B242 bandwidth upgrade (200 MHz), 4x RT-ZP03 probes, logic analyser cable with 16 logic probes and power cord. Premium 4 channel oscilloscope with 200 MHz Bandwidth, 2.5 GSa/s sample rate, 10 Bit A/D converter, 20 Mpts memory depth and a 25.7 cm touchdisplay (1280x800 pixel). Upgradable to a MSO with a 16 channel logic analyzer, 1 channel waveform generator and pattern generator. RTB2004 oscilloscope, RTB-B242 bandwidth upgrade (200 MHz), 4x RT-ZP03 probes and power cord. Premium 4 channel oscilloscope with 100 MHz Bandwidth, 2.5 GSa/s sample rate, 10 Bit A/D converter, 20 Mpts memory depth and a 25.7 cm touchdisplay (1280x800 pixel). Incl. MSO option with 16 channel logic analyzer. Upgradable with a 1 channel waveform generator and pattern generator. RTB2004 oscilloscope, RTB-B1 MSO upgrade option, RTB-B241 bandwidth upgrade (100 MHz), 4x RT-ZP03 probes, logic analyser cable with 16 logic probes and power cord. Premium 4 channel oscilloscope with 100 MHz Bandwidth, 2.5 GSa/s sample rate, 10 Bit A/D converter, 20 Mpts memory depth and a 25.7 cm touchdisplay (1280x800 pixel). Upgradable to a MSO with a 16 channel logic analyzer, 1 channel waveform generator and pattern generator. RTB2004 oscilloscope, RTB-B241 bandwidth upgrade (100 MHz), 4x RT-ZP03 probes and power cord. High quality 2 channel oscilloscope with 200 MHz bandwidth, 1 GSa/s and 14 Mpts memory depth with enhanced math and measurement functions and a 17.8 cm LCD display (800x480 pixel). Serial decoders for I²C, SPI, RS232/UART, CAN and LIN are already included! 2 probes PP215 (bandwidth 200 MHz), USB cable, power adapter. Handheld 2 channel full touch tablet DSO with 70 MHz bandwidth and 1 GSa/s sampling rate. Incl. decoder Bundle for UART, CAN, LIN, SPI and I2C decoding. 2 probes P130A (bandwidth 200 MHz), Lithium Battery (7500 mAh), Belt and power adapter. Handheld 4 channel full touch tablet DSO with 70 MHz bandwidth and 1 GSa/s sampling rate. Incl. decoder Bundle for UART, CAN, LIN, SPI and I2C decoding. 4 probes P130A (bandwidth 200 MHz), Lithium Battery (7500 mAh), Belt and power adapter. Handheld 2 channel full touch tablet DSO with 150 MHz bandwidth and 1 GSa/s sampling rate. Incl. decoder Bundle for UART, CAN, LIN, SPI and I2C decoding. Handheld 4 channel full touch tablet DSO with 100 MHz bandwidth and 1 GSa/s sampling rate. Incl. decoder Bundle for UART, CAN, LIN, SPI and I2C decoding. Spectrum analyzer from 9 kHz to 3.2 GHz.